The Ennejma Ezzahra palace has undergone restoration and rehabilitation works since its acquisition by the Tunisian State in 1989. However, it is the first time since it was opened to the public in 1992 that the palace is closed to visits for the implementation of such works. The suspension of public visit and for a relatively long period (five months from 1 January 2017), does not mean the cessation of the activities of the various departments of the Centre for Arab and Mediterranean Music, including the museum activity. The closing period will be used to advance, among other things, restoration work on the woodwork inside the palace. 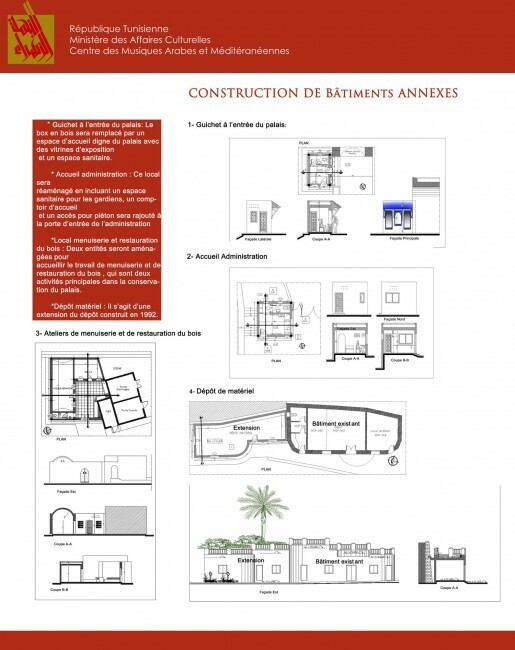 - Finally the construction of an equipment depot below the terrace in front of the palace, adjacent to the old depot built in 1996 and which was intended to store the chairs and stage elements intended for open-air shows. 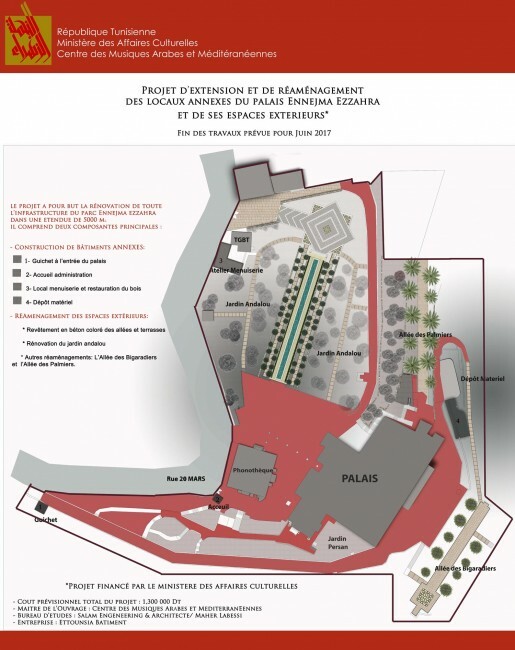 As for the redevelopment works, they will concern the restoration of three alleys: namely the monumental alley leading from the main entrance to the palace, the “Allée des Bigaradiers” located below the terrace facing the palace , and finally the “ Allée des Palmiers”, linking the palace to the so-called Korsi Essollah stairs, eading all the way down to the corniche. The rehabilitation works, which be will also affect the Andalusian garden, located on the upper level, opposite the Belvedere building, which now houses the National sound archive and part of the administration offices. 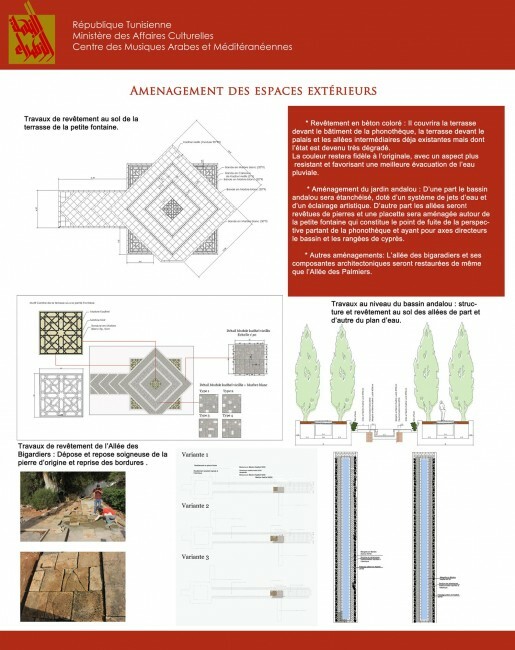 With an estimated cost of 1.2 Million Tunisian Dinars , the works will meet both the urgent need for additional premises required by the Centre 's day-to-day activities and contribute to improving the visitors’ quality of experience , as well as enhance the historic gardens of Ennejma Ezzahra. The idea is also to offer well-equipped and secure spaces that can attract private events, the financial spin-offs of which will help bolster the institution's own revenues.